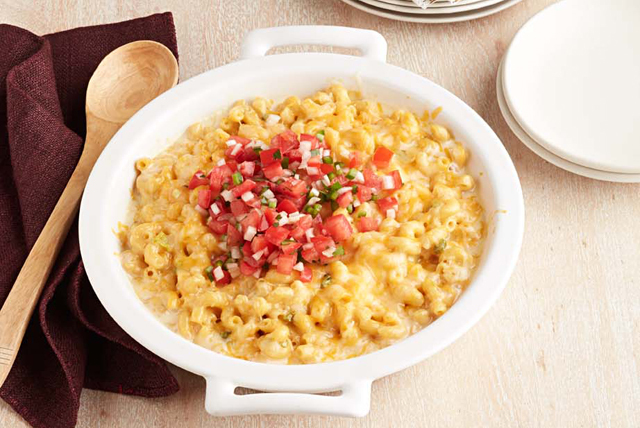 Just when you thought nothing new could be done to mac and cheese, the KRAFT KITCHENS developed a new twist on the classic. Add a kick of flavour to your homemade mac and cheese with our One-Dish Green Chile Mac and Cheese recipe. Combine evaporated milk, Velveeta and chiles in microwaveable 2-L casserole dish sprayed with cooking spray. Microwave on HIGH 5 min. or until Velveeta is completely melted and sauce is well blended, stirring after 3 min. Stir in 2% milk, then macaroni; cover. Bake 45 min. or until macaroni is tender, stirring after 30 min. Top with shredded cheese; bake. uncovered, 10 min. or until melted. Top with pico de gallo. An open bag of Cracker Barrel Shredded Cheese can be tightly sealed and stored in the freezer for use in cooking. You don't have to thaw it--simply add the frozen cheese to your dish and cook as directed.